A card is selected and returned to the pack which is then shuffled. 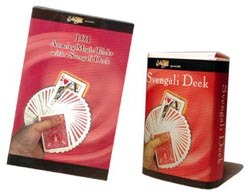 The magician then feels the backs of the cards one at a time and is able to find the selected card by sensing which card is warmer from the spectators touch! The selected card is then shuffled into the pack again only to jump to the top of the deck. The cards are then cut once placing the selected card in the middle of the pack - but say the magic words and the selected card is on top again! Kit comes with the magic deck of cards and instructional DVD. Returns will not be accepted for open CD's or DVD's.